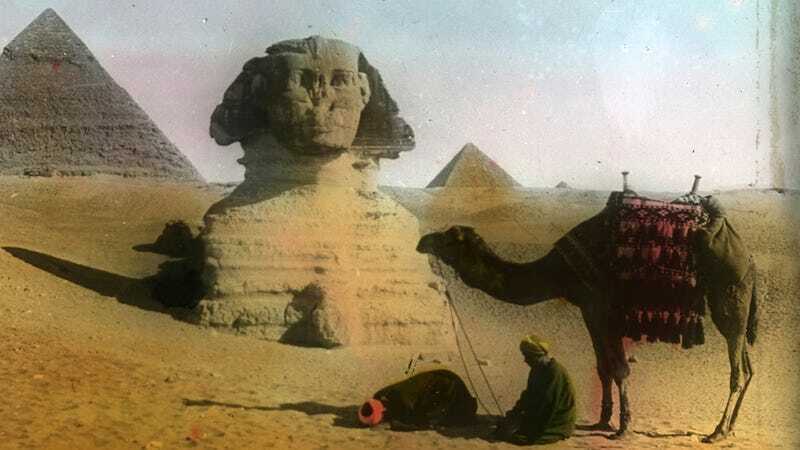 In the late nineteenth century, Western archaeologists and tourists were fascinated by the ruins of ancient Egypt. Here are some of the incredible photos they took, which were hand-tinted in the fashion of the day. This is like meta-history, where we look back on an historical method of looking back at ancient history. The Aswan Low Dam was completed in 1902 near the island of Philae, which was nearly always looded. In the 1960s the UNESCO started a project to save the buildings and transported them to a nearby island. Abu Simbel temples, relocated between 1964 and 1968 because of the same reasons as Philae, mentioned above. Pompey's Pillar, a (88 ft or 26.85 m tall including its base and capital) Roman triumphal column in Alexandra, the largest outside Rome and Constantinople and one of the largest monolithic columns ever erected, built in 297 AD. It was climbed by Commander John Shortland and John White on 3 February, 1803 and displayed the Union Flag there and drank a toast to King George III. Three days later they climbed it again, toasted the king and ate a beef steak.